Many YouTubers like me are trying to figure out how to Increase YouTube RPM. In this blog post, I’ll explain some neat tricks to increase YouTube RPM and boost your Adsense Earnings. Before posting this blog post, I want you to know my YouTube Earnings Journey. I’m making videos for 2-3 years and I’ve faced many up’s and downs in YouTube Adsense Earnings. Don’t confuse with RPM – Revolutions per Minute YouTube RPM is somewhat different. It’s the rate which is used to calculate your Estimated Earnings for 1000 Impressions. RPM – Revenue per 1000 Impressions. Estimated Earnings for Website Monetization is calculated and listed for every day by Google itself. But it’s different for YouTube Monetization. The revenue generated from YouTube Videos are calculated and listed in Estimated Earnings for once in a Month which is generally around 10th-15th. To calculate Everyday Estimated earnings generated by YouTube Monetization we need to divide our Video Impressions with 1000 and Multiple the value with our RPM Rate. The resultant is our Estimated Earnings for the day. YouTubeMoney.co takes the input of impressions and RPM rate and calculates the Estimated Daily Earnings automatically. 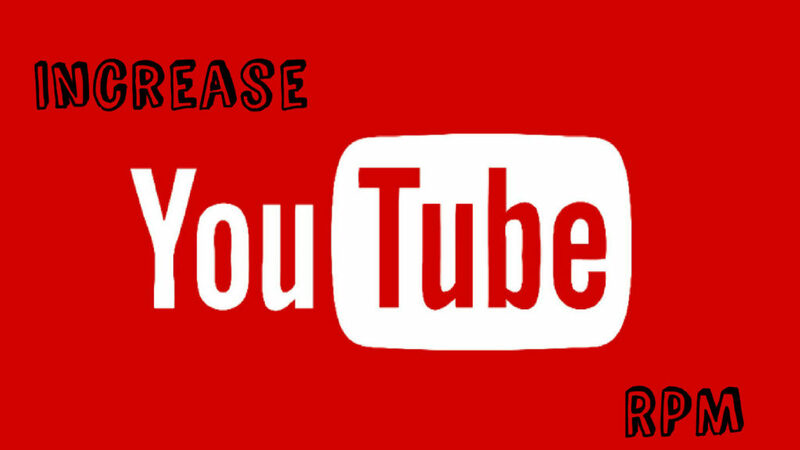 There are several factors to increase or vary YouTube RPM. Some of the factors depend on what kind of videos we’re uploading, Category of Videos, Video Length, publishing time and Social Shares etc., Now let’s get into it one by one. While publishing a Video go to Monetization Tab and there you’ll find a section for apply Ad Breaks. I would recommend selecting ” Suggest Ad Breaks “ Option because giving ad breaks for every minute or half won’t do you any good, The Ad won’t be refreshed. I upload in 4K quality and Quality Videos rank higher in YouTube. Mostly videos of quality 360p , 240p, and even 144p doesn’t display skippable ads, I’ll explain this later. Mainly try to get Video Likes, and Comments. These two are the major Social Activities that are used to Increase YouTube RPM. In past days YouTube Favorite is also a ranking factor but not now. Make sure to get huge Traffic from platforms like Reddit. Reddit helps to get good Traffic from High RPM countries like US and UK. Use of Custom Thumbnail helps in attracting visitors to watch YouTube Videos. According to many YouTube Pro’s Publishing Time really matters to Increase RPM for that particular day, I personally experienced Publishing my videos 12PM at night increased my YouTube RPM for around 67% . Many YouTubers claim that publishing Videos on Tuesdays , Thursdays and Saturday’s are best for gaining more bucks. When it comes to other Factors Google search is flooded with one term ” YouTube Network ” or ” MCN ” or ” Multi Channel Network “. But being in MCN is not encouraged by Many YouTubers because of many restrictions and all. I’ll explain the Whole MCN think in my future posts which cover How to Rank YouTube Videos like PRO and How to get your Channel into MCN. Do let me know if you are having any doubts in the comments section below. as you have a lot of experience in youtube , my problem is i started my channel nearly 10 months ago and i have over 5 MILLION views but 5 months ago my channel decreasing may it views or revenue decreasing day by from 160k views to 5k views don’t know the reason mine is food channel please help me i am from hyderabad thank you. Just amazing and interesting information you shared here. Also i don”t know how to earning more with youtube and what is youtube RPM but reading above information i understood many things like monetize and many more. Thanx for sharing best information. I’m glad that this article helped you. Do visit more often. Thank you. Just another great post. Indeed here you explain very well on youtube RPM. I don”t know what is youtube RPM but after reading your above information i understood all of things. Please updates more as soon as possible. please define monetized playback RPM, my videos have 20,000-40,000 views per day but monetize playback so low as 400-500, in beginning its reached 1000-3000 but it low now why it happen and what is the solution,,? Video views are not equal to Monetized views. At the beginning your videos might have ranked well, now they’ve lost their rankings. There are many reasons for that. You’ve improve in ranking your videos well. Oh This is amazing tips to increase RPM…I will try these tips..!! I’m glad you liked the article. Hope my tips helps you reach more heights as an YouTuber. If you’ve any further query reply back or hit me up via Social Media/Contact Form I’ll help you in person. man i get 2cent per 1000 views , Desaster! can you provide me your Channel URL? to see what’s the problem is? You earn 6$ per day or per month? 6$ per month is very very low. I’ve gone through your YouTube channel and it’s good. Your problem of earning low might depend on several factors. I’ll list them below, Make sure you have set them right. 1. First of all Gaming and Gameplay Fottage channels have very low RPM rates when compared to other channel coz Gamers are not going to produce any new content rather they’re using Someone else ( Game Producers ) content. So you can’t do anything in this matter. 2. Make sure you uncheck ” disable Interest Based Ads “. You’ll find this setting in your Dashboard –> Channel –> Advanced. 4. Check all those Ad units ” Display Ads ” , ” Overlay Ads “, ” Skippable Ads ” in Monetization section. 5. If your’e in a MCN or Not? reply to this comment. you can earn more just make sure you complete all those and try ranking your videos. if you don’t get enough organic video views then you get any high cpc and your earnings will stuck at 6$ only. yeah you can. Just read the article carefully and apply those tactics. every one knew that Google is no.1 search engine. Guess what the 2nd most popular search is YouTube so to get more views and high cpc on your YouTube videos you need to rank those videos on YouTube video search. There are very simple strategies to do that, Just google how to rank YouTube videos you’ll many articles to teach that. YouTube doesn’t pay basing on your views. They consider watchtime and Video Quality and Niche. I think you’ve to research more. I’ve gone through your channels statistics and they’re pretty fine. Your’e earning good according to them. Still there might be many reasons for your low earnings try contacting YouTube regarding this issue. Recently they’ve started demonetizing videos which are inappropriate for Ad companies and your videos are not of original content. can you please share the how page views and page impressions you’re getting per day and what’s the page rpm and impression rpm of that day? For 50K views 7$ is good earnings. See earning more depends on Video Quality, Watch Time, Niche and Geo Locations. Upload more content and generate more views. Hey This is Good Ideas Regarding Increase Your RPM On Youtube and Thank You So Much For these Amazing Ideas Dear. Hello Anirudh, Nice article!! I have a USA based political channel. But CPC is very low, hardly .03 or .04, maximum I got .06. Daily views are 800-1500.
your cpc is good than other niches. Try to improve watch time. Make longer videos than 10 mins and insert more ad breaks than usual. You’ll earn more for sure. i have 44,926 views on channel and i earned 63.91$ is that good sign or not ! on first month of channel i got 5$ for 1000 views .. suddenly its decrease.. what to do?? Actually, it’s Good. 63$ is good. Try publishing longer videos and insert more ad breaks. 37$ is also good Revenue. Normal earnings for your view count. Try more ad breaks as I told you. 2. You’ve uploaded 3 cricket videos and 2 other videos. So, YouTube is unable to identify your Channel Niche or Category. So YouTube is blocking many Cricket related Ad Partners ads to be displayed on your YouTube Videos. So it’s better to maintain single category or Niche on your Sites. 3. Main thing is Your Videos length is around 2 mins. Which is not recommended. If you Post more than 10 min video length content then you can add ad breaks which increase more ad units = more revenue! should i remove those cricket videos ?? Let’s connect on Facebook. Comment section is becoming like a Q & A.
Hello Ani, fantastic post you’ve written there! I’m commenting just to clarify on one thing. On your post you’ve mentioned that you targeted on Tues, Thurs and Sat for increased RPM. You mentioned “12PM at night”. Did you mean 12AM at night or 12PM in the afternoon? And were you referring to the US timezone? Thanks for commenting, My bad. it’s 12 am at night in India. I’m from India so I’m targeting the United States. If you’re from the United States try to post around 8 am in the morning when people are more likely to view YouTube. will restructuring my youtube channel affect its earnings , i usually upload entertainment videos but now i want to delete those videos and make it a gaming channel with only gaming videos…..i m basically asking this question because my average page rpm is 0.10$ which is very low and after restructuring i will upload gaming videos , will my page rpm be same ? ?….i thought about making new channel but i have 5k subscribers and i don’t want to lose them….plzz help me anirudh…. i don’t want to continue with that much low earning…. Home many videos are there in your channel now? I won’t be an issue. Just upload your Gaming Videos in the same channel itself. No need to remove previous videos, Just upload more videos and dominate those previous videos. So that YouTube identifies your Niche and promote advertisers accordingly. THIS IS VERY USEFUL INFORMATION FOR ME I APPLY IT ON MY NEXT VIDEOS . THANKS FOR SHARING INFO. 1. Increase Video Lenght to >10 mins. 2. Post same Niche Videos. Nope different accounts won’t be any problem. Educational and plain videos are very low CPC Niche’s. Do keyword Research while publishing videos. Publish more CPC Keyword Videos. It won’t do any good. Stick with education and do keyword research. BTW How many Video Views do you get on daily basis. Changing Category that is more relevant to your niche improves Rankings for sure. But I’m not sure It’ll increases CPC or RPM. Try experimenting by changing the Category and let us know does that worked or not? Yeah you can post Funny Videos and Movie Related News under entertainment category, that won’t be an issue. You can also post Trending videos but If there are not related to main Category they might perform less, Rank slowly and Gain less revenue. ok…that means my channel rpm is good? why page views showing more than youtube views? very much difference….why? Can You Please Suggest Me A Channel Niche That Is Actually Capable Of Inviting More High Paying Advertisers …. For High Paying Advertisers go for Tech. High Competition but Payments are good. Thanks for the great article Anirudh! Iam from Chennai and im going to start a youtube channel for movie and trailer reviews with fun elements in regional language (Tamil) and also planned to upload videos of latest cine news and updates in the same channel, as i researched about the channels doing the same, the channel (Tamil Talkies) which having videos of duration (3-6mins) having more views and subscribers than a channel (Tamilcinemareview) having videos of (7-10mins). So what length videos i should make and how much RPM i’ll get for those category videos. Don’t expect High RPM rate during starting stages. Video Length depends on the content, Higher the Better and also consider Video Retention. Hi Anirudh thanks for the great article! Iam from Chennai and im going to start an youtube channel for movie & trailer reviews with fun elements in regional language “Tamil. And also planned to posting videos of latest cine news and updates in the same channel. As I researched in youtube there are 2 top channels doing reviews and the one (Tamil Talkies) which has videos duration of (3-6mins) having more views and more subscribers than the other one (tamilcinemareview) which has duration of (6-10mins). So kindly suggest me the best range of video duration and what is the RPM i’ll get for that category videos. Im planning to post minimum 4 to 5 videos per week. Pls suggest your views on my plans. and i want to be a full time youtuber. Thanks a lot! I’ll update the status of my channel soon! Hi Anirudh Thanks For the Nice Article. Bro I’m Having Youtube Channel Named Cinewood Green (www.youtube.com/c/cinewoodgreen). Last Week I Applied MCN(BBTV) and It Was Rejected yesterday Becaz I’m Having Copyright Strike. Thats Not a Issue . But My Channel Ad Clicks are Very Low But My Views Remains Same. After Rejection I’m getting low clicks or whats the problem bro Please Tell Some remedies . They’ve rejected, right? So you’re still affiliated to AdSense.The MCN has nothing to do with your RPM. It might be issue with your Niche which has very low RPM or you might be blocking ad categories in your Adsense Account. Do a double check on all these things. Bro I checked my Adsense twice I didn’t blocked any ads. I don’t know why? It is huge difference on my clicks. Can you help me? Your channel is good and stats say it’s earning more than your results. How you’re checking earnings per day? Very helpful article thanks a lot bro..
Hello and thanks for the article. I saw that you rewiev different youtube pages and help them know their personal problems. Can you please look at my channel too? It’s really hard for me with only 0,04$ RPM and ~15000 daily views. YouTube is dead. It’s facing lots of issues and right now it’s no good for people who are really onto YouTube for money making.